Sorry, I haven't posted in awhile. I was busy stitching another model for Lisa. I just finished it last night and now I'm back to working on Shores of Hawk Run Hollow. The rocks are taking forever! I'll be glad when I finish them up! Well, nothing else going on here - just hanging out with the kids (they have five days off because of teacher furlough days and the MLK holiday). I am going up to Amy's tomorrow and I'm so looking forward to it! I really need a day off! :) Write soon! Paula - For Sarah Woodham I'm using 40 ct. Vintage Pearled Barley and the recommended silk threads. 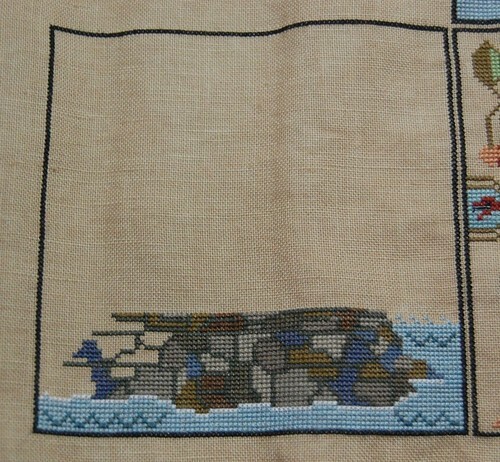 You're making wonderful progress on Shores, I think block 2 is my favourite. Great progress on Shores; you're almost done! Enjoy your day with Amy tomorrow! Shores is looking really good. Have fun tomorrow with Amy! Great progress! Have fun at Amy's! You are cruisin on this!! 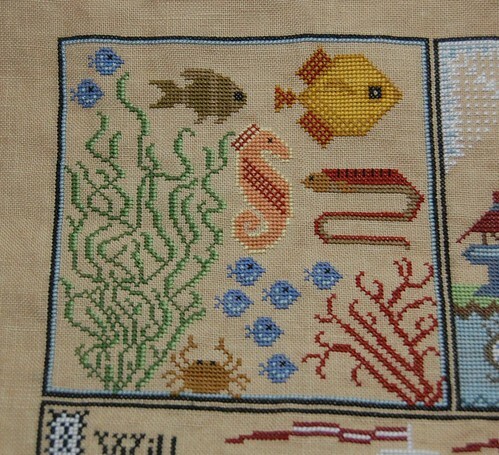 Love this one :) Have a great stitching weekend. Looking forward to the model you are stitching on too!!! Oh your Shores is coming along nicely. You GO GIRL! You are making such great progress on Shores. You're going to have it finished in no time. Hope you have a lot of fun tomorrow! 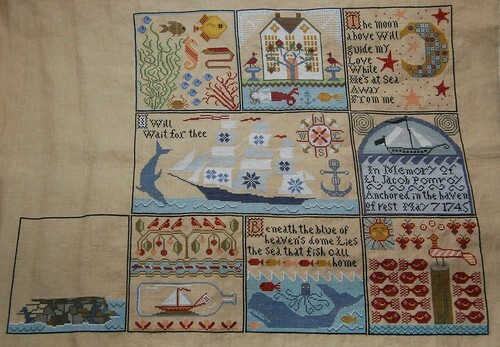 The shore is definitely in sight with this one - you will be finished in no time. Lovely. The shores is beautiful Nicole! I will begin this year with shores, I have the fabric and the pattern, I think using NPI silk. Wonderful progress Nicole, it's looking lovely! Great progress! It's so pretty. Great progress! Know you had a fun day! Whoo hooo! You are sailing right along. Beautiful! Shores is coming along just beautifully, it will be gorgeous when finished. Wow you are so close!!!! It's gorgeous. Have a fun day tomorrow.